Eight Ukrainian citizens have asked Ukraine's consul to help them move from the Greek city of Kineta to Athens because of wildfires, spokesperson for the consular service department of the Ministry of Foreign Affairs of Ukraine (MFA) Vasyl Kyrylych has said. "The consul established contact with eight Ukrainian citizens (four adults, four children) who are not in danger and should leave for Ukraine on July 26," he said in a comment to Interfax-Ukraine on Tuesday. According to him, they are helped to find another place of residence in Athens. Kyrylych added that as of 15.40, there are no Ukrainian citizens among those killed or injured by wildfires. Ukrainian Foreign Minister Pavlo Klimkin expressed his condolences due to numerous victims of fires in Greece. 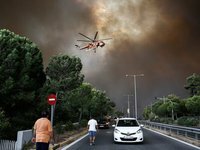 "Deeply saddened by tragic loss of life caused by raging forest fires in areas around Athens. Our sincere condolences to the victims and their families," he wrote on Twitter. Kyiv to take all necessary measures to protect interests of legal entities and individuals in Ukraine after Russia's "sanctions"